We are open 7 days a week apart from Christmas Day, Boxing Day, New Years Day, Easter Sunday and Easter Monday. Apart from the above Bank Holidays the only other day we close is for our annual stock take which is normally the last Sunday in June or the 1st Sunday in July. We are located in central Manchester on the block next to the House of Fraser store Kendals. There are many car parks close by and the free City Centre bus services (1 & 2) are at our door. All buses link us with the main railway stations. To see the route maps for all the Free Buses and information on frequency click here. Still owned and managed by the same family since being established in 1857 Forsyth fills its 15,000sq ft (1,500sq m) building in central Manchester with musical merchandise and restoration facilities. We have extensive Sales Departments for sheet music, classical & jazz recordings, acoustic pianos, digital pianos, guitars, orchestral instruments and all accessories. We will sometimes take instruments in part exchange - just let us know what you have. We also have piano and instrument repair services with our own tuners, technicians and luthiers. For schools, teachers and professional musicians we offer full account facilities. Our staff are highly experienced, both in terms of retail and musical experience generally. We are all musicians or music lovers on the staff and this passion and commitment is present in everything we do. We are fortunate to have a variety of highly qualified performers, teachers, scholars and technicians throughout the store. Piano tuning, regulation, voicing and rebuilding services. Sheet Music Department - Comprehensive and independant Sheet Music department - over 30,000 titles in stock and rapid customer ordering service. Many schools, libraries and universities trust us to supply them their music. Guitars - Outstanding array of interesting acoustic and classical guitars as well as many specialist electrics, all carefully chosen by our enthusiast and knowledgable staff - over 300 guitars in total. Strings - Superior range of instruments including our own brand instruments made for us in Europe. We have a fully qualified Luthier in store. Woodwind - Full range available at all levels. 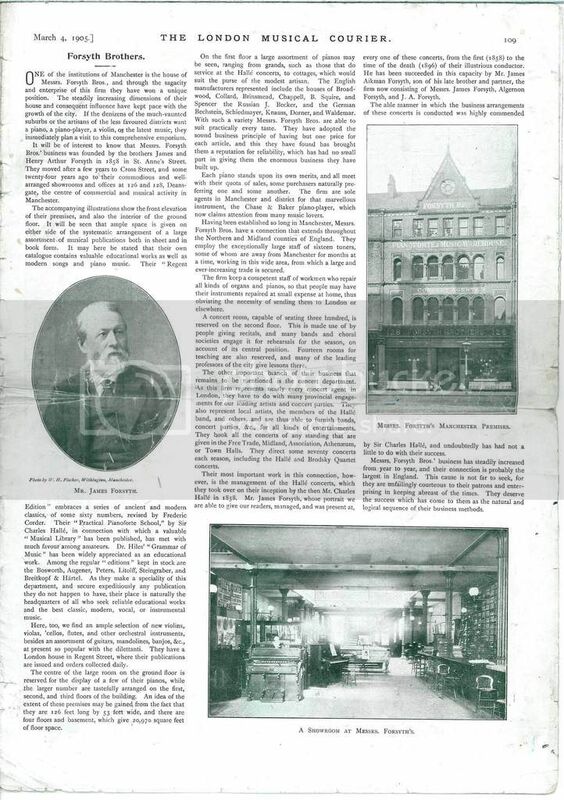 History and background of Forsyth Brothers Ltd. In 1857 the Forsyth brothers settled in Manchester to help Charles Hallé set up the Hallé orchestra, having learned their trade with their father - the factory manager for Messrs Broadwood in Golden Square, described by Beethoven as the “prince of piano makers”. 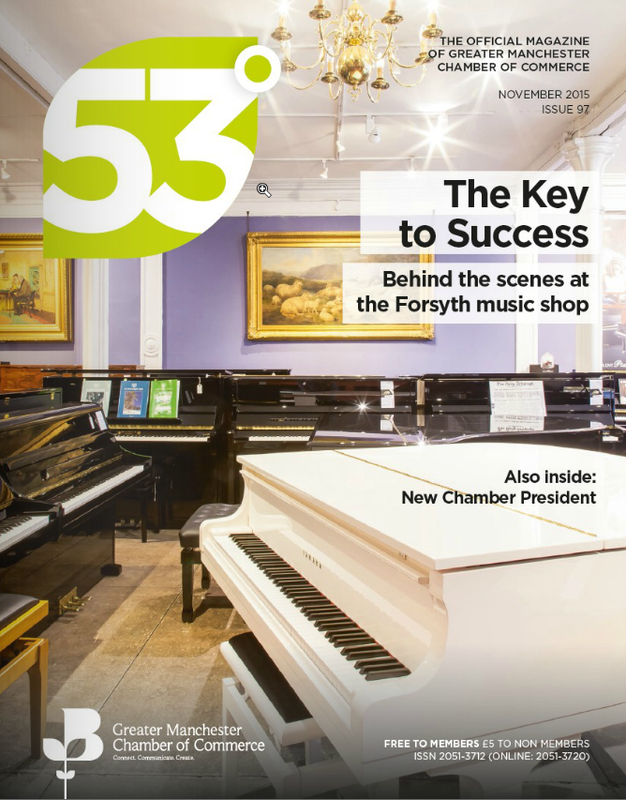 After initially specialising only in Pianos, Forsyth soon diversified into supplying sheet music and all other instruments. Forsyth is still run by the same family (4th and 5th generation) over 160 years later. During our 150th anniversary year we researched our archives and found a wealth of fascinating information about Forsyth’s history. This includes an article that was written about the firm in 1905 for the London Musical Chronicle which is available to view and read here. We are celebrating our 160th anniversary in 2017-18 with an on going refit of the store, including the recent replacement of our shop sign, which had survived since our 100th birthday in 1957. Our historic Manchester shop remains synonymous with the supply of musical merchandise, particularly pianos, while our growing online store enables us to supply customers the length and breadth of the United Kingdom and also many parts of the world. Whatever your requirement you can trust us for advice and after sales service. In Manchester we have a large shop on five floors (three floors of showrooms) in total covering over 15,000 sq ft. We have well over 200 quality acoustic pianos and 40 digital pianos for you to choose from including Steinway, Bechstein, Bosendorfer, Ibach, Eavestaff, Boston, Schimmel, Yamaha, Kawai, Kemble, Opus, May Berlin, Vogel etc. We have, over recent years, added automatic pianos to our list of specialties and are able to provide a variety of alternatives at exceptional prices. We stock a range of Disklaviers and a variety of other automated instruments including Pianodisc and QRS. Indeed we can automate almost any piano such that it will perform when you press play on a CD player, disc drive or iPod! In addition to pianos we have a comprehensive Instruments and Accessories Department with over 300 guitars, many string, woodwind, brass, and percussion instruments - plus many other instruments and accessories. We also have a very large Sheet Music Department and a classical Recorded Music Department all backed up by our efficient Mail Order service and friendly expert staff - nothing is too much trouble. Over our 160 years in business we have made many contacts in the music business all over the world. If you have any unusual requests please don’t hesitate to ask. Our 160th anniversary was celebrated in this I Love Manchester article on Manchester's oldest shops. Celebrations were also enlivened by a mystery pianist on the #forsythspiano street piano outside our store. Christopher Scamp's playing was captured on smart phone by a watching member of the public and subsequently went viral on Facebook and other social media, watched by millions of people all around the world. Our subsequent gift to Chris of a Kawai digital piano also went viral, and the piano can regularly be seen on his Facebook Live broadcasts. We were featured on the BBC1 national TV series Christmas City in December 2016. The series covers all the different aspects and characters of a city as they prepare for Christmas. 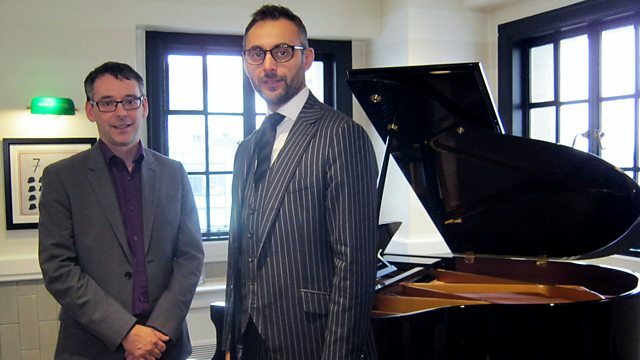 Forsyth is featured together with Hotel Gotham (Winner of Boutique Hotel of the Year 2016) in Episode 3.